programming that bring about a strong sense of place. DoranBrowne has an internationally acclaimed track record of successful start-up initiatives and has recently founded the Arts Over Borders: northern literary lands in Ireland (CVs below). ‘a remarkable homage for the groundbreaking album’. ‘The programme is hugely ambitious…….Sgt Pepper at 50: Heading for Home has been co-curated by Sean Doran, the former artistic director of English National Opera now considered the pre-eminent festival director in Europe’. ‘With high-spirited humour, eccentric charm and a joyous musical sensibility, Morris has revisited the album’s ambition and influence to produce an hour-long celebration that is as ingenious as it is entertaining’. ‘There was one particularly special moment. It was not just special because we had to get up very early on a Sunday morning and make our way in the cold to a muddy spot overlooking Church Island in Lough Beg – a feature in the landscape where Heaney imagined so many of his poems. It was probably because Fiona Shaw was performing Heaney’s words from in hay cart in a field steeped in mist…….So we were here, we were there and we were also in Shaw’s voice and in Heaney’s words and at his home. The past and the present and the future collapsed in this moment’. 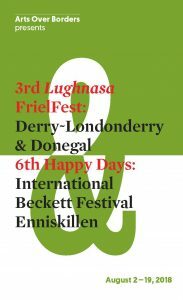 ‘With a programme that includes theatre, talks, readings, recitals, dance and exhibitions, Happy Days: Enniskillen International Beckett festival embraces not only works by the Irish playwright but those of his celebrated contemporaries. Those familiar with this island locale may wonder how a parish equipped with just a single purpose-built theatre can possibly provide the necessary infrastructure for a serious shindig, let alone what has become one of the most enthralling festivals in the cultural calendar’.